There are a few spots left in the hands-on Golden Touch Blackjack course, which I'll be teaching the weekend of Oct. 23 & 24 in Las Vegas. Details are below. This month Vinny DeCarlo presents nine "different" ways that counters can gain the edge over the casino (I guarantee you haven't thought of some of them). You think you are being cheated while playing blackjack? Check out Basil Nestor's article for five ways that you can tell if the game is bogus. Our blackjack answer man John Grochowski answers several more questions including an interesting one about the possibility of the casinos cheating using an automatic card shuffler. Our Midwest blackjack pro JPB visited the casinos in the St. Louis area and reports on playing conditions there. Meanwhile, our low-roller Riverboat Flyer took a cruise to the Caribbean and reports on playing conditions on the shipboard casino , and several casinos on the Islands. Frank Scoblete reports on the new owners of two Atlantic City casinos, as well as providing the current playing conditions in the A.C. casinos. LVBear growls about what a casino did in Nevada, and he offers a rare praise to the Nevada Gaming Control Board in another incident. Kenneth Smith provides some excellent playing tips for Three Card Poker Tournaments (which many blackjack tournament players are finding very lucrative). Have you ever heard of the legendary blackjack player Howard Thorn? If not, read Sammy Vaughn's article. Don't we wish we could get the "nuts" when we play Texas Hold'em? However, getting them doesn't guarantee that you will win ... read Bill Burton's poker column for the details. We also have an updated version of Monkeysytem's strategy for the unusual rule that allows you to doubling down after splitting aces. Lastly, we have a summary of the September and October major blackjack tournaments around the country courtesy of www.blackjacktournaments.com. If you want to stop gambling when you play blackjack, and finally get the edge over the casino, then you need to attend this weekend course taught by blackjack master Henry Tamburin. In two days of intense hands-on training with Tamburin, you will, plain and simple, become an advantage player. You'll learn Speed Count and the Optimum Basic Playing Strategy plus other important points that you must know (bankroll, Risk of Ruin, camouflage, etc.) to be a successful card counter (including invaluable tips from Henry's 30-plus years as a card counter and teacher). The course will be held October 23 & 24 in a non-casino hotel in Las Vegas (Note: This is the last class that Henry will be teaching in 2010). BJI subscribers get a $100 discount. Class size is limited and classes fill up quickly so sign up TODAY (for details about the class, visit www.goldentouchblackjack.com, or call 1-262-598-9354 to sign-up). Speed Count was easy to learn. The practice play made learning the playing strategy and Speed Count easy to master. I feel excited knowing that I can play blackjack with an edge. The lesson on bankroll and risk of ruin was a real eye opener. I never played blackjack before, yet I was able to learn everything in just weekend. This Speed Count is easy to use in the casino. I tried it on Saturday night and I had no problem keeping the count. Plus I won money! Henry Tamburin is one hell of a terrific instructor. This is the best well-organized and taught course that I've ever taken and I've attended many courses in my lifetime. E-mail subscribers can also read each month's issue online at our web site: BJI Issue #128, September 2010. 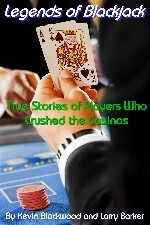 Blackjack Insider publishes a wide range of e-books on all things related to advantage gambling... from beating casino tournaments to casino surveillance. These e-books are all available in Acrobat PDF format, for easy reading and printing on your computer. These valuable books contain information not available anywhere else, in print or otherwise! Check out these great values in our online store. NO! Speed Count, the easiest advantage-play blackjack method will have you beating the casinos in only a few minutes of practice. It really is that easy... if you ever play blackjack in the casinos, then you are crazy to not learn the Speed Count card counting method. Add blackjack to your game-plan to beat the casinos, and Speed Count is mathematically proven to get you an edge over the casino. NEW from DeepNet Technologies! Now their great blackjack basic strategy trainer is available for iPhone and iPod touch. Includes new automatic action table selection from 144 built-in tables for different blackjack rules (including surrender and ENHC). "Here are nine diversionary tactics to strike the casino when they are at their weakest. You can take them to the bank..."
"Recently, I was consulting for an Internet casino. After a long day of testing the blackjack software, I called one of the owners of the company and told him flatly, 'Your game is fixed'..."
""I was at a casino when one of the card shuffle machines was malfunctioning and the floor boss made the comment, "It's missing some Kings." That got me thinking. Sometimes too much thinking is a dangerous thing, but in this case, if the shuffle machine is identifying individual cards, what prevents this machine from stacking cards in such a way that in an eight-deck shoe, the casino would get a significant advantage?..." "There are seven casinos in the St. Louis area. There is one new casino - River City - since my last report over a year ago. This report is based on my visits to the St. Louis casinos during March-August 2010. 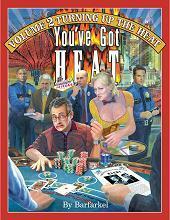 I found one good blackjack game for the card counter - unfortunately, the casino has increasingly taken countermeasures..."
"In my never-ending attempt to combine blackjack and vacations, my wife and I embarked on a Caribbean cruise recently. This trip was on the Carnival Cruise Line, which I had no previous experience with. Stops would include Nassau and Freeport, locations where I knew there would be land based casinos..."
"Frank writes about the new owners of the Sands and Resorts, and his team of reporters update the blackjack playing conditions in AC..."
"LVBear growls about a casino telling its employees to lie to a patron, and offers a rare praise to the Nevada Gaming Control Board for their investigation of a false imprisonment case that occurred at a Las Vegas casino..."
"Three Card Poker tournaments are offered in many casinos, but little has ever been published about the strategies appropriate to these events. 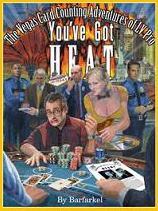 While many of the general tournament ideas apply across all games, three card poker certainly has twists unique to that particular game..."
"There are more stories circulating in Nevada about "Howard" than any other personality in any field. He joins the select few, who are one-name figures such as Elvis, Liberace, Frank, and our boy Howard..."
"When you play poker and have a hand that cannot be beaten, it's called the "Nuts." Every player hopes to flop the nuts because they are guaranteed to win the hand, but how much money you win will depend on how you play the hand..."
"This is an updated strategy for this unusual rule that we first published in Monkeysystem's article in BJI #127..."
"Check out the schedule of major blackjack tournaments in September and October by region in our Blackjack Tournament Report courtesy of blackjacktournaments.com..."